Here’s another new Metallica single from the upcoming album DEATH MAGNETIC….. So what do you think of this one? 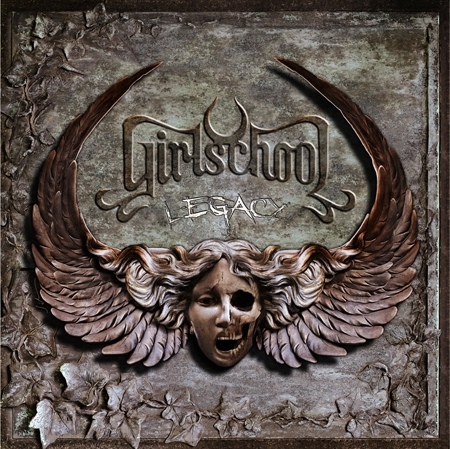 The new album titled LEGACY from Girlschool will be released through Wacken Records / Steamhammer on October 24th in Germany, October 27th in Europe and November 4th in the USA. 30 years of female powered heavy Rock N Roll, 30 years of Girlschool. The longest existing all-girl band Girlschool is back with a bang. Their newest album Legacy mixes old school Classic Rock with new and modern influences. As Legacy is the 30th anniversary album of Girlschool some friends showed up and left their mark. RONNIE JAMES DIO is singing on the bonus-track version of ‘I Spy’ as well as Lemmy left his voice on ‘Don’t Talk To Me’ and such musicians like J.J. French (TWISTED SISTER), Neil Murray, Phil Campbell (MOTÖRHEAD), Fast Eddie Clarke, Eddie Ojeda (Twisted Sister) and Tony Iommi (HEAVEN AND HELL) left clicks and licks on several songs too. Even the original guitarist Kelly Johnson, who died last year, can be heard on the opener ‘Everything Is The Same’ with a special ghost appearance! But enough talking, take a deep breath and enjoy the Legacy. 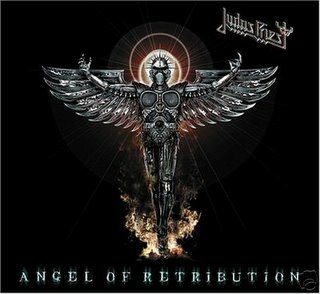 solo) Motörhead cover, ‘Don`t Mess Around’ ( feat. Eddie Ojeda – guitar solo), ‘Zeitgeist’, ‘Don’t Talk To Me’ ( feat. Lemmy on bass, vocals and triangle). Bonus Tracks: ‘I Spy’ (Dio/Iommi Mix) ( feat. Ronnie James Dio on vocals, Tony Iommi – lead guitar), ‘Emergency’, ‘London’. Here’s the new single from AC/DC from the upcoming album BLACK ICE…..
Here’s the new Metallica single from the upcoming album DEATH MAGNETIC….. I was organizing my CD collection the other day and I started pulling out my Iced Earth albums to give them all a fresh listen. 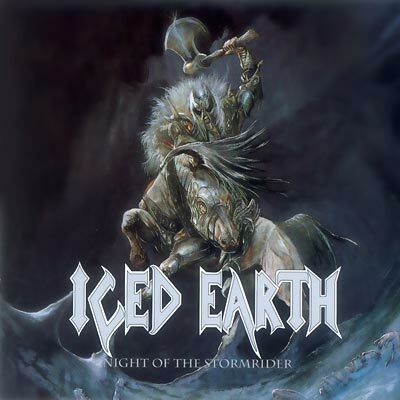 I listened to the first album, ICED EARTH, released way back in 1991 and I was about to move on to NIGHT OF THE STORMRIDER when I realized that it was missing! I checked the entire music room, I checked every shelf and pile of CDs, and I looked in the storage boxes I used when we moved into this house two years ago…..nothing. What I did find was an old notebook that had an old Want List in it. Lo and behold! NIGHT OF THE STORMRIDER is listed! I was sure I already had this CD, I know I’ve listened to it many times so I reached back into my memory to figure out why I don’t have the disc but I know the album so well. I went to a box of CDRs that I have ignored for a few years and, tucked away nice and neat, was a burned copy of the album. In the CD case where the artwork would be there was an index card that read: “BUY A.S.A.P. – ORIGINAL CD RETURNED/RIPPED BACK TRAYCARD”. Mystery solved! I only want the original issue of the disc, I am not interested in the 2002 remastered version with the different artwork remastered/remixed music. CD Scavenger Hunt – 2 Months To Catch Up! 1. Money is being spent wisely — I don’t think I have to tell anyone, especially here in the U.S., how bad the state of the economy is. Electricity has gone up, gas is still over $3.50/gallon, Heating Oil is $4.20/gallon this season, and food has gone up. A sign of the times! The extra money I usually spend on music has been saved. 2. End of Summer slowdown — The labels like to save some key releases for the last third of the year and some heavyweights are releasing albums in the next couple months: Metallica, AC/DC, Iced Earth, Metal Church, Tesla and many more. July and August are usually slow with bands out on tour for the summer season and the promotion teams gearing up for the Fall releases. 3. I’m way behind! — I never thought that a simple blog about my Heavy Metal & Hard Rock collection would connect me with so many bands, PR people, and record labels. Everyday brings a new CD submitted for review and I have a good 50 albums or so sitting in a pile waiting for more spins. I need to catch up! Alice Cooper – Along Came A Spider (2008) – $9.99: I bought this the day it came out for a nice sale price. Unfortunately, I haven’t really given this record all that much attention. I’ve listened a few times but that’s about it, this is in my pile for extra consumption this week and I just uploaded it to my MP3 player so I can listen at work. Mad Margritt – Cold Sweat (1997) – $25: This album has been on my want list for a long time but the price usually goes through the roof on Ebay. I was browsing on Ebay a couple of weeks ago and I typed in the band name but misspelled the word “Margritt”, I left off the 2nd “T”. Good thing I did because I was able to win this CD for $20 & $5 shipping with no competition. There was another copy from another seller up for sale at the same time but the band name was spelled correctly in the listing title, everyone was after that one and the bids rose. This takes COLD SWEAT off the WANTED! list. Kerrang! – Maiden Heaven (A Tribute To Iron Maiden) (2008) – $7: I haven’t bought an issue of Kerrang! in years, I usually thumb through it in the bookstore. When the tribute CD was announced, I figured that I would drive the 20 minutes to the Barnes & Noble and actually buy it…..but I got lazy. True Rhode Islanders believe that anything more than a 15 minute drive is too far and, in true native fashion, I couldn’t have been bothered. I ordered online and the issue showed up a month later with the CD. My birthday was August 16th and I decided to have a low key day. My kids are usually good for taking mom to the local record shop for a gift card but they decided that Dad should get himself a new tour shirt from the Metal Masters show instead. A mysterious package was delivered that day from my estranged father in Texas. The package contained 3 CDs: the new Motley Crue, the new Disturbed, and the new Miley Cyrus! I gave the new Miley to my 5 yr old daughter (my 10 yr old daughter has it already), I already own the new Crue and I hate Disturbed. All the discs were sealed so I walked into the local shop and returned them for a $30 credit! Extreme – Saudades De Rock (2008) – $9.99: Always loved Extreme, especially their debut album. I saw their reunion show in Boston back in June 2006 and I have been patiently waiting for some new material. I’ve read some really good reviews about this album so this was a no-brainer…..I still haven’t taken off the shrinkwrap! Motorhead – Bomber (Deluxe Expanded Edition) (2005) – $19.99: This was the last 2 CD deluxe edition I needed of the Motorhead studio albums. I should have bought it right away a few years ago when it came out and was on sale but I didn’t and I’ve been staring at the same copy with the same $20 price tag for close to 3 years! I could have passed again but I wanted to complete my set. I’m off work tonite due to a last minute schedule change. Am I tired? Of course! I slept all day after I got home from work this morning so I’m good, I could always use extra sleep though! So I’m unexpectedly off from work, the family is asleep, and I am locked in my music room spinning CDs…..
Cloudscape – Global Drama (2008): What a great album this is! 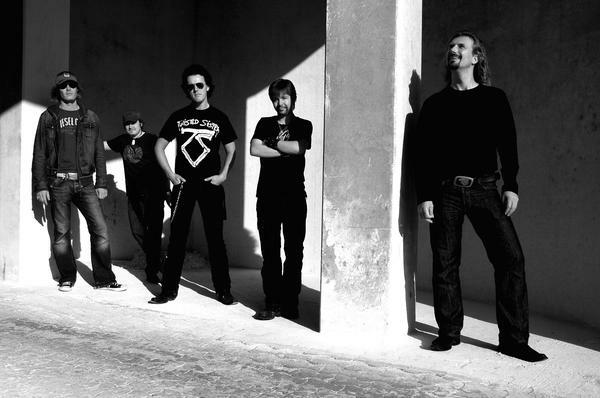 Cloudscape is high quality Power/Progressive Metal, akin to Balance Of Power. GLOBAL DRAMA came out last Tuesday officially but I have been enjoying the disc for a few weeks now. Review this week! Biloxi – III -In The Wake Of The Storm (2007): Another album I’ve been enjoying a lot lately and it’s a top candidate of my year end list of albums I missed in 2007. Founding vocalist/guitarist Clyde Holly sadly passed away during the recording process so he only sings on 2 songs and contributes guitars to 5. Mark Allen Lanoue has filled in very well in place of Clyde and the band pays tribute to him by creating some good melodic Hard Rock. Iced Earth – The Crucible Of Man (Something Wicked Pt. 2) (2008): This doesn’t come out for two more weeks but let me tell you this…..it’s awesome! Bringing Matt Barlow back to the band is probably the smartest thing Jon Schaffer has done since the original SOMETHING WICKED THIS WAY COMES in 1998. Another solid release for 2008! 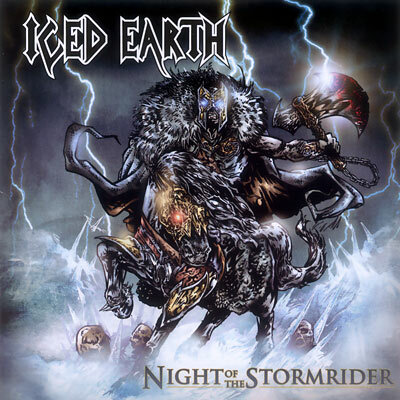 Iced Earth – Framing Armageddon (Something Wicked Pt. 1) (2007): I’ve been a big Iced Earth fan since BURNT OFFERINGS (1995) but I just didn’t get into the Tim ‘Ripper’ Owens era of the band. I thought that THE GLORIOUS BURDEN (2004) was boring and I didn’t get into this album until the end of last year. It made my list of the Top 15 Albums Of 2007, coming in at lucky #13! I figured I’d give it a fresh listen. Metal Church – This Present Wasteland (2008): Another album that doesn’t come out until the end of September. I will be reviewing this one soon so I’m not giving much away right now. Grim Reaper – See You In Hell (1984): I had to put a classic in there with all the new releases! I haven’t given this a listen in a long time and I needed a NWOBHM fix. I remember being a kid in ’84 and getting a poster of the album cover from a metal mag, I had that poster on my wall until I moved out of my mom’s house…..14 years! Nothing is better than reviewing an album by a New England area Metal band! 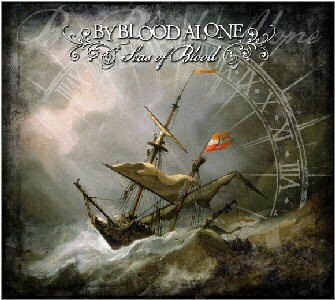 By Blood Alone comes from Portland, Maine and SEAS OF BLOOD is the band’s first full-length album that follows up their recording debut, the four song E.P., ETERNALLY (2005). With a name like By Blood Alone, you would expect the band to be a brutal and vicious Heavy Metal band but that is not the case. 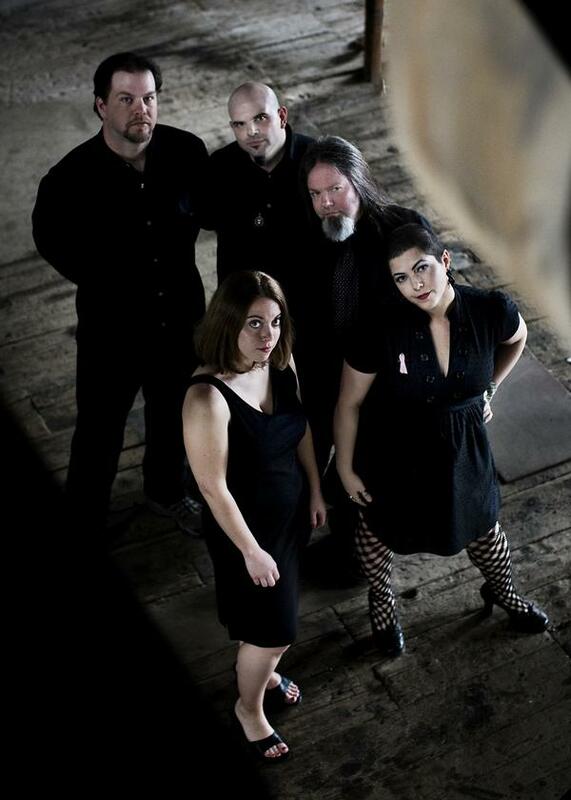 By Blood Alone is a female-fronted Gothic/Progressive Metal band, in the same style as After Forever, Lacuna Coil, Nightwish and Temujin, with an emphasis on atmospheric keyboards, a driving guitar and haunting vocals. The Progressive side of the band is their lengthy “jamming” sound that takes most of the songs past the 7 minute mark and provides each member a way to stretch out on their given instrument. There are lengthy solos and instrumental section in the longer songs that help provide a wider soundscape for the band to explore. There are plenty of time and tempo changes to keep the songs sounding fresh and interesting. The Gothic side of the band is clear with the excellent keystrokes of Jenny Williamson and the vocals of lead singer Cruella. I would say that there is a fair bit of Celtic/Renaissance influence to the music also, I can hear a touch of Blackmore’s Night on some of the songs. The sound isn’t really heavy and I think that is due to John Graveside’s guitar being too low in the mix while the keys and vocals are way out front. That’s a production issue that could easily be fixed. Vocally, Cruella is very good, she has a very beautiful voice. The problem I had is that I was waiting for her to go for it! To let go, hit some serious highs and belt these songs out with some power…..but she doesn’t, Cruella stays on an even keel and I guess it fits haunting style the band captures. That is the difference between By Blood Alone and the other female-fronted bands out there…..power. If there was more power in the vocals, more aggression, then I think the songs would stand out more. ‘Serpentarius’ clocks in at 7:30 and starts out sounding like a true Metal song with an opening guitar intro followed by galloping drums & bass and layered keyboards. Very uptempo at first but the middle section slows down into an extended instrumental break. Cruella shows off some power here but is stuck too low in the mix. Same thing with ‘Wants Me Dead’, it starts off with a galloping rhythm and guitar but slows down a little once the vocals and keys kick in. There’s a solo break after the first chorus that gives off a Blackmore’s Night feel to the song but I don’t hear woodwinds or a mandolin so I think I like this a little better! I like this song, it has me wanting a more uptempo pace because the band does it well. ‘Undead Friend’ is haunting track that starts out with this basic piano melody and Cruella’s singing. As the song progresses, the rest of the instruments join in, along with some extra keyboards. Very atmospheric, you get a chilling sense of beauty. Another 7+ minute song arrives in the form of ‘Nidhogg’ that is right out of the Blackmore’s Night playbook. Again, no hurdy gurdies or flutes, the keyboards set the sounds and there is another lengthy instrumental section in the middle that lets each member stretch out a bit. It’s at this time, halfway through the album, that I realize that Cruella’s vocal performance is kind of the same as Anneke Van Giersbergen’s on The Gathering’s 1999 album HOW TO MEASURE A PLANET: a very even delivery within a very defined sound. Almost too even actually. The trend continues on ‘Lovely Lies’ although the music is a little more aggressive and the guitars weave in and out with the keyboards. The drums are mixed a little high but that’s OK because they give the song a little kick. ‘Lovely Lies’ is the band longest song on the album at just over 8 minutes but it is also the best in providing an overall picture of the band and the album. The title track is another long song and follows the same formula as ‘Serpentarius’ and ‘Nidhogg’ but there seems to be some life in the production here! The mix sounds a little better with everything sounding equal, one insturment not being drowned out from another. Best vocal performance of the album by Cruella and she is not mixed too low either! A half minute instrumental opens ‘Deny Yourself’ and gives the sense that By Blood Alone is going to gallop along again like on ‘Wants Me Dead’. There are some quick breaks where one gets the sense that the music slows a little but, for the most part, ‘Deny Yourself’ is uptempo with some interesting drum fills. Of course, halfway though the song, the band slows the pace down to a crawl and provide another haunting mood. Things pick up again with the instrumental solo section but, by this point, I’ve heard them do this on almost every song! ‘Little Lady Lillit’ is all vocals and piano and it almost sounds like a child’s nursery rhyme! It’s interesting, especially when you hear the lyrics. Overall, I liked the album. I’m a big fan of female-fronted Gothic styled bands and By Blood Alone fits that category. The band has songs and they are talented musicians but what they desperately need is a new producer. I haven’t heard any other albums produced by Steve La Cerra but I have enough albums of this genre in my collection to know what works and what doesn’t. SEAS OF BLOOD is begging for a remix! The keyboards are way up front in the mix most of the time and the vocals are either too high or too low. There are guitars here but Graveside is usually too low and under the keyboards. Same goes with the bass, mixed way too low. I adjusted my equalizer to bring in more bass and you can definitely hear Jack Doran. Now just because the mix is a mess doesn’t mean that the musicians are bad, they are all actually very good, especially keyboardist Jenny Williamson. If ambient/Gothic music is what you are going to do, then you need a great keyboardist…..Williamson is the real deal! If Cruella put a little more thunder in her vocals and John Graveside got his guitar equal time with the keys, By Blood Alone would be a heavier band. I like what I hear and I want to hear more…..I bet the band goes over really well live. Definitely a band I will be watching closely in the future. Following the successful 2007 release of the coveted 4-CD+DVD Warchest box set, MEGADETH is back with a vengeance with Anthology: Set The World Afire. The career-spanning 2-CD and digital collection, to be released September 30th by Capitol/EMI, features Megadeth’s top hits and fan favorites, a previously unreleased demo and two rare concert recordings. 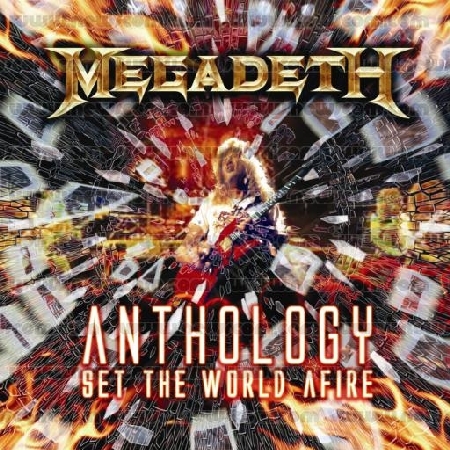 Anthology: Set The World Afire is loaded with 35 electrifying tracks, among them Megadeth’s top hits, including ‘Trust’, ‘A Tout Le Monde’, ‘Insomnia’ and ‘Train Of Consequences’. Also included are rare 1992 concert recordings of ‘Peace Sells’ and ‘Symphony of Destruction’, previously available only in limited release, the latter having never been released in the U.S.
‘High Speed Dirt’ is a demo version, previously unreleased. Iconic frontman Dave Mustaine pioneered the hugely successful metal band, Megadeth after his departure from METALLICA. Beginning with the band’s 1985 debut album, Killing Is My Business … And Business Is Good!, and evolving through a shifting series of lineups, Megadeth crafted a dynamic, intelligent style that combined the aggressiveness of thrash metal, the improvisational nature of jazz, and cynical, articulate, politically-charged lyrics into an innovative mix that built a rabid worldwide following. In 1992, Megadeth burst into the mainstream with their fifth album, Countdown To Extinction, which debuted at #2 on Billboard’s Top 200 Albums chart and went on to sell more than two million copies in the U.S. alone. 1994’s Youthanasia followed with a #4 debut, while 1997’s Cryptic Writings yielded four Top 20 hits at rock radio, including ‘Trust’ and ‘Almost Honest’. After a brief hiatus in 2002, Megadeth made a bold return when their tenth studio album, The System Has Failed, debuted at #18 on Billboard’s Top 200. In recent years, Mustaine has also overseen the broad remastering campaign for Megadeth’s Capitol Records catalog, which began with the band’s second album, Peace Sells … But Who’s Buying? Mustaine spent months remixing, remastering, restoring – and in some cases, reconstructing – the band’s Capitol catalog to bring it as close to his original vision as possible. Each reissue and last year’s career-spanning Warchest box set is packed with unreleased tracks, demos and alternate mixes, as well as new liner notes by the iconoclastic Mustaine. For the majority of three decades, Megadeth has yanked heavy metal into the future – musically, lyrically, and culturally – and worked the raw soil into something desirable and dangerous. With defiance and grace, through unusual quality and intelligence, Megadeth has raised a generation on a diet of truth serum and bitter pills. Instead of being kicked to the curb for their insolence, they’ve been rewarded with seven Grammy nominations and five platinum and multi-platinum albums. On September 30, Megadeth will continue to build on this powerful legacy with Anthology: Set The World Afire and will prove once again that they are an indispensable part of heavy metal history. ‘Sleepwalker’, ‘Symphony Of Destruction’ (live, Cow Palace, 1992)**, ‘Peace Sells’ (live, Cow Palace, 1992). ‘Reckoning Day’, ‘A Tout Le Monde’, ‘The Killing Road’, ‘New World Order’, ‘Trust The Punishment Due’, ‘Tornado of Souls’, ‘Hangar 18’, ‘Take No Prisoners’, ‘Go To Hell’, ‘Sweating Bullets’, ‘Crown of Worms’, ‘High Speed Dirt’ [Demo]. 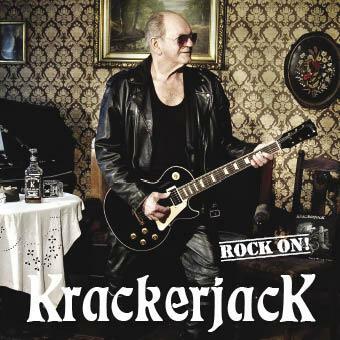 ** Previously unreleased in the U.S.
Krackerjack is a Rock band from Denmark and have a ’70s Classic Rock sound that is very melodic and full of chunky guitar riffs, solid drumming, and a Deep Purple styled organ play. On first listen to ROCK ON!, Krackerjack’s third record, I couldn’t help but double check the date on the back of the tray card. Was this really released in 2007 or more like 1977? The sound is a blend of ’70s legends (Deep Purple, Whitesnake, and UFO) and some of the early ’80s AOR/Rock greats (Great White, Survivor and Night Ranger), dominated by the guitar and organ. The overall music sound is bluesy Hard Rock (like UFO) with the thick David Coverdale style pipes of Allan G. Pedersen, the Jon Lord influenced keyboards of Claus Greve, and the blues-based guitarwork of René Mikkelsen. Right away the songs sound dated but there is an air of freshness to them because they are so straight forward Rock. The comparisons to UFO, Purple, & ‘Snake are easy to make but I also mentioned Great White, Survivor and Night Ranger. If you stripped away the prominence of the organ, and if Pedersen had a higher voice, this album could easily fall into the ’80s AOR category. There is plenty of melodies and harmonies in every song along with really catchy lyrics…..it’s fun music. That’s what good AOR is…..fun. With a little production tweak or tonal change in the sound, these songs could be easily msitaken for either band. Krackerjack also has that Hard Rock sound that Great White used for MTV stardom. All in all, it’s a really good blend of sound that bridges one decade to the next. ‘Love’em To Death’ has an AC/DC quality to it with it’s basic riff rock/boogie woogie guitar sound but it sounds like early Whitesnake as soon as Pedersen starts singing. It’s remarkable how much he sounds like Coverdale at his bluesy best. The chorus is catchy as hell and the exchanges between the organ and guitar really give the song a fantastic energy. ‘This Heart’ is a big time radio style ballad that is extremely melodic and takes me back a couple decades when music like this ruled the roost. Same with the title track, it just has that upbeat, melodic, Hard Rock sound that could easily be heard on Rock radio today. I would put this up against the Stainds, Nickelbacks, and Puddles of Mudds of the world any day of the week! I really like the way the guitar and organ play off each other and give the song some depth. One of the longest songs on the album is ‘Blame It On The Little Big Man’ and it’s probably my least favorite. It’s not necessarily a bad song but it just sounds like something all those Nickelbacks and Stainds would put out. You can call it a ballad, even mid-paced if you want, but it’s long and it sounds like too much of the same…..the only thing separating the song from today’s whiney Hard Rock is the key strokes of Claus Greve and a somking guitar solo courtesy of René Mikkelsen. Krackerjack gets right back on track with the uptempo ‘Lonely’ that features the guitar & organ mirroring each other on the main riff. Good harmonies on the chorus, the organ solo is influenced by the great Jon Lord and maybe even Don Airey, it definitely sounds like a UFO or Deep Purple track. I like the guitar based ‘Back Together’ with it’s cool bass line, solid drumming, and harmonies and the ’70s styled ‘Waiting For Tomorrow’, a ballad rich in the Blues and dripping with emotion. ‘Hungry Boy’ picks things up again but is more of the same as the other rockers on the album, at this point the band is following a formula that works but is getting too familiar. ‘Lullaby’ is another hard rocker but it sounds a little more like ’80s Hard Rock than bluesy ’70s Rock. It’s more melodic, has more harmonies and good spacing between the guitar and keys. I like the ’70s feel to the record but the melodic sense Krackerjack has is a huge plus, it’s what separates them from being too retro. The closer on ROCK ON! is ‘Too Late’ and it’s another one of those long mid-paced/ballad type songs drenched in guitar and organ. It’s a good song, I like it best of all the slow songs, but I expected Krackerjack to end the album on a hot rockin’ note. A really good record and a nice surprise. I admit that I didn’t expect much from one look at the album cover but that old saying of “don’t judge a book by it’s cover” is so true. This is a true Rock record that has enough melody, harmony, good songwriting, and musical performances to compete with the more popular Rock bands on the charts. I’m very impressed with Allen Pedersen’s deep melodic vocals and the interplay between the guitar and keyboards. I have always been a big fan of bands that use a Hammond Organ so it’s safe to say that I am jumping on the Krackerjack bandwagon. This is a band to watch! Fans of Deep Purple, early Whitesnake, UFO, and Great White should take notice! 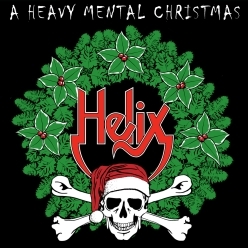 The day after Halloween we will be releasing the first-ever Helix Christmas CD entitled HELIX-HEAVY MENTAL CHRISTMAS. The CD will be available in Walmart stores across Canada, and we have been told it will be front racked, along with the soon-to-be-released AC/DC & Metallica CDs. The CD will be distributed by Fontana/Universal. We are very excited about this project, and with good reason. We’ve done some different versions of traditional Christmas songs, as well as taking a few contemporary numbers and jazzing them up, ie. “Simply Having a Wonderful Christmas Time” by Paul McCartney. We also found a gem in Bob Segar’s “Sock It To Me Santa” and even penned one of our own, a Motorhead-sounding ditty entitled, “It’s Christmastime Again”. The CD is being recorded at “A” Studios in London, Ontario. Gord Prior is producing with Aaron Murray engineering. The release of Heavy Mental Christmas will coincide with a western Canadian tour in November. We also hope to play our hometown of London around the same time period. We will announce our tour dates as we get them. Motley Crue has a new video in support of their latest album, SAINTS OF LOS ANGELES…..check out ‘Mutherfucker Of The Year’…..